Third-party videogame accessory provider Mad Catz has inked a deal with Rock Band publisher MTV Networks to provide peripherals for the game. The multi-year licensing agreement will bring Mad Catz' Rock Band controllers to the market sometime in the first half of 2008. The firm now has the rights to manufacture, market and sell Rock Band peripherals and other Rock Band-related products. Mad Catz’ instrument controllers will be produced for Xbox 360, PlayStation 3 and PS2. The peripheral maker said that guitars would come in wired and wireless varieties. In Rock Band, which is distributed by Electronic Arts, four players can play together simultaneously using two guitar controllers (bass/lead guitar), a drum kit and a microphone. Mad Catz will be releasing versions of all Rock Band peripherals. 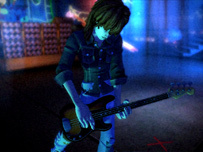 MTV Networks and its development studio Harmonix have ran into snags with Rock Band controllers since the game’s US release in November 2007. Faulty strum bars plagued the guitars, and tight supply has prevented the release of individual instruments outside of the $170 bundle (or $160 for PS2). “The addition of the Rock Band license is consistent with Mad Catz’ stated goal to align ourselves with the most attractive brands and highly-anticipated software releases while seeking additional accessory opportunities to further diversify and grow our revenue base," said Mad Catz CEO Darren Richardson in a statement.